Jean Baptiste Le Sueur, Première scène de la Révolution française à Paris, 12 juillet 1789, c. 1792-95. And thus I can glory in the fact that the first act of the Revolution began chez moi. Services du Sieur Curtius, 1790. 12th July 1789, a Sunday: News of the dismissal of Necker was greeted with mounting indignation by the crowd gathered in the Palais-Royal, haranged by Desmoulins and others. In the late afternoon a large contingent moved off towards the Opera to demand the closure of the theatres as a sign of mourning. A group of protestors arrived at Curtius's premises in the Boulevard du Temple just as he was closing up and made off with the wax busts of Necker and the duc d'Orléans. They were then covered in black crepe and paraded through the streets, accompanied by black banners and muffled drumming. Curtius, who was after all the duc's man, reluctantly agreed to give up his figures. According to one published account, the waxworks were taken on deposit - "en déposant la valeur" (Récit de ce qui s'est passé à Paris le 12 juillet, quoted, Daninos, Une Révolution en cire, p.36) Curtius managed to dissuade the protestors from commandeering the full-length portrait-figure of the King which would be too heavy and cumbersome to handle. 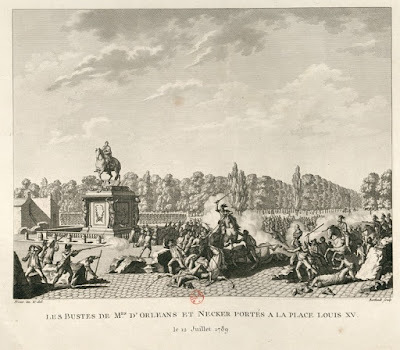 The crowd - according to one estimate now 6,000 strong - returned via the Palais-Royal, to the place Vendôme, then moved on to the place Louis XV where it clashed with a contingent of dragoons who was stationed there. Spilling into the Tuileries Gardens, it was "charged" by the prince de Lambesc, at the head of a contingent of the Royal-Allemand; at least one person was killed and many others were injured. In the turmoil, the citizen carrying the bust of Orléans, a pedlar named François Pépin, was shot in the ankle and taken back to the Palais-Royal to have his wounds treated. The citizen carrying the figure of Necker was allegedly killed by one of the dragoons as he fled. Curtius's man, who had been trailing the protestors, was able to retrieve the bust of the duc, which was deposited at the Tuileries; the damaged statue of Necker was restored to the waxworks a few days later. Curtius, "Vainqueur de la Bastille"
On 23rd July, as soon as was decently possible, Curtius resigned his commission, though he remained a member of the garde bourgeois. He took the precaution of obtaining from the Hôtel de Ville a paper accepting his resignation with regret and recognising the valuable service he had given in the position. The following day he donated forty-eight livres to the district committee as a gesture of goodwill (see Chapman, The French Revolution as seen by Madame Tussaud, p.85). On 5th-6th October he contrived to avoid accompanying his fellow guardsmen to Versailles when he was ordered to take eight men and guard the deserted Bastille. On 6th he was on hand to help to help with the less dangerous task of shepherding the crowds which escorted the Royal family back to Paris, an immense procession "preceded by a great convoy of flour wagons, a train of artillery and a multitude of carriages". In Curtius's version of events his commanding officer Hulin embraced him and said he had rendered as good a service as if he had come to Versailles (Chapman, p.83). No doubt Curtius was grateful afterwards to return to his business. His priorities may be surmised from a surviving letter of 11th November addressed to the members of his district in which he suggests a voluntary contribution to raise a guard for the Boulevard du Temple. [MS Letter from the Bibl. de Ville, of 11th November 1789, quoted in Arthur Heulhard, La Foire Saint-Laurent (1878),p.147-8]. Services du Sieur Curtius vainqueur de la Bastille depuis le 12 juillet jusqu'au 6 octobre 1789, 1790, 27 pages. Inevitably, the events of the Fourteenth of July became one of the principal attractions at Curtius's cabinets; the fact that he himself had participated added an air of authenticity to the exhibits. The inscribed gun and sword awarded to him as a "Vainqueur" were displayed throughout the Revolution; indeed the gun survived to feature in Madame Tussaud's Baker Street exhibition. In the winter of 1790 the German playwright August von Kotzebue, saw among the figures at the Palais-Royal, Lafayette, Bailly, Clermont Tonnerre and the prisoners of the Bastille "Trent und la Tude". The Almanach général listed at the Boulevard du Temple in 1790 the King, Lafayette and Bailly, plus "the famous sieur Hulin, sieur Elie and the others principal victors of the Bastille, with celebrated prisoners of the fortress". There was also a plan of the prison engraved on a stone, plus various cardboard models. The stone was purchased from Palloy on 18th January 1790 and was said to have come from near the entrance to one of the Bastille's dungeons. Curtius had it engraved with a patriotic couplet. In February he wrote to Palloy to request a copy of the misplaced certificate of authenticity, since he wished to present the stone to the Assembly. He evidently kept it in his exhibition for a while since it was it only presented to the Assembly on 18th November 1790 [Daninos, p.36-8]. A stone from the Bastille, with key attached, was displayed at Madame Tussauds until 1925; but this was a different one, purchased by waxworks in 1860.
towards the end of 1789 and remained a loyal Robespierriste. Following the municipal reforms of May 1790 he was elected captain of the company of Chasseurs attached to the section of the Temple into which the former pères de Nazareth district had been incorporated. (The duties of the newly formed Chasseurs involved mainly policing the barrières and prevent loss of revenue through smuggling.). 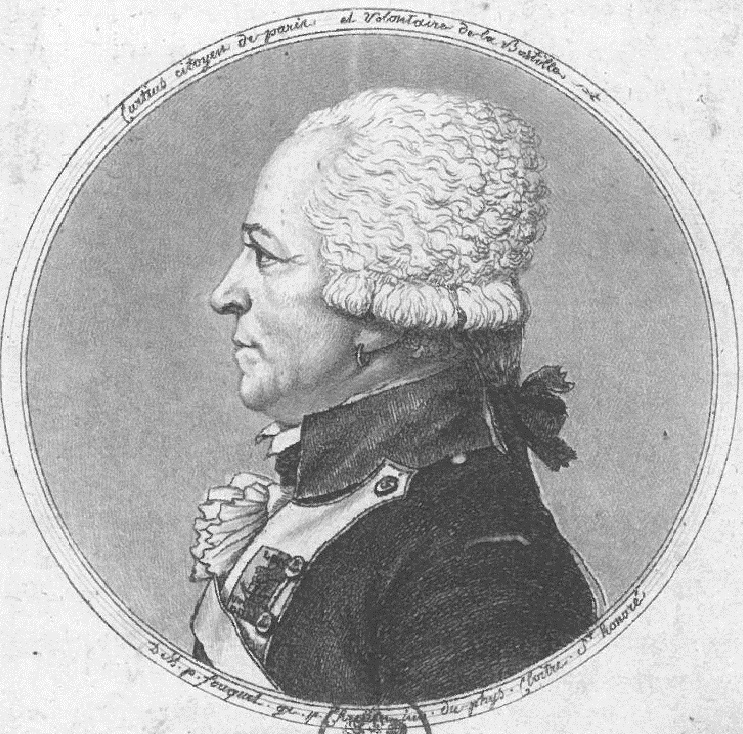 It is from this time that the only surviving portrait of Curtius dates, a head-and-shoulders profile in the uniform of the Chasseurs, which was similar to that of the National Guard but with green ornamentation. We are informed that the engraving (of which there are two variants) was executed using Gilles-Louis Chrétien's "physionotrace" machine after a portrait by Jean-Baptiste Fouquet. Curtius is identified as "citizen of Paris" and "volunteer of the Bastille"(see Daninos, p.30 and 31; Pauline Chapman, p.89). In October 1792 the Jacobin Club appointed Curtius defenseur or protector of Austrian or Prussian deserters, whom he was forced to accommodate at his own expense in folding beds on his premises (Chapman, p.127). There are records of various financial contributions: In the course of 1792-3 he made at least two "voluntary donations" of 120 livres to the war effort. In October 1793 he undertook to donate a further 200 livres every six months for the duration of the war in the Vendée (Daninos, p..40). From November 1792 the National Assembly entrusted Curtius, a German speaker, with several missions to the Army of the Rhine. Perhaps Curtius himself instigated this: his second patriotic donation of 120 livres on 5th October 1792 had been accompanied by a letter to the President of the newly formed National Convention asking for General Custine's help in pursuing his lost inheritance in the newly-captured Mainz. (Chapman, p. 126). By December Curtius himself was in Mainz: a letter of 2nd December 1792 read to the Jacobin Club confirmed his friendly reception by the local Jacobins, the "Mainzer Club". A further letter to the President of the Convention, dated 27th June 1793, which warranted an "Honorable Mention", excused the tardiness of his latest voluntary contribution on the grounds he had been away on mission "visiting the storehouses of the Army of the Rhine" (Chapman, p. 140). In all probability the mould for the life mask of Custine in the Musée Grévin dates from this time. If Curtius himself survived the Terror, his business faced increasing difficulties. At first the Salon de cire seems to have prospered: the Almanach général for 1791 fulsomely praised the patriotic displays. 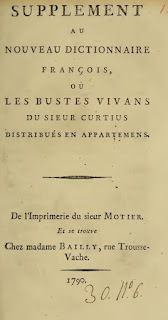 An anti-Revolutionary pamphlet published in 1790, Supplément au Nouveau dictionnaire français, even used an imaginary tour of Curtius's "living busts" as a vehicle for ironic comment on the plight of the Royal family and the pretentions of Revolutionary politicians. In 1790 Curtius's name appeared in a publication which purported to list secret gratifications entered in Louis XVI's personal account book, the so-called "Red Book". It was revealed that in 1784 he had received a remuneration of 2,000 livres "in consideration of his talents and services": having been obliged to abandon his cabinet of criminals, Curtius had merely substituted thieves of a different sort "farmers-general, lieutenants of the police, and princes of the blood"; now "whether through laziness or economy", he recycled former villains into Revolutionary heroes. In 1792 the Almanach général, which had praised Curtius so generously the previous year, condemned him for his "false and dangerous patriotism". It is not certain exactly what fault Curtius had committed, but on 24th August 1791, he wrote to the Assembly to acknowledge his error of judgment in exhibiting a figure of Lafayette - recently declared an enemy of the Revolution: to make amends he had publically decapitated his model and impaled the head on a lance (Archives parlementaire, cited Daninos, p.42). Nonetheless, in September - less than three months after the flight to Varennes - he was sufficiently imprudent to exhibit a coloured bust of the "Prince Royal" in the Salon du Louvre, open for the first time to non-Academicians. At some point in 1791 or 1792 Curtius gave up his Salon de cire at the Palais-Royal and moved his models back to the boulevards. He can occasionally be glimpsed introducing new Revolutionary subjects. On 23rd January 1793, the Jacobin Club had ordered Curtius to make a bust of Le Peletier, who had been assassinated on 20th. For the Salon, he produced an elaborate wax tableau showing Le Peletier on his deathbed as depicted in the spectacular funeral laid on by David on 24th. The wax work anticipated David's painting, which was presented to the Convention on the 29th. In July 1793 came the death of Marat. In December 1793 Curtius was added Madame du Barry's severed head to his exhibition. Prudhomme's Révolutions de Paris, criticised Curtius for neglecting to model Louis XVI on the scaffold; perhaps, even for Curtius, this was a step too far. In 1793 Curtius had began to make payments on a small house in Ivry-sur-Seine. It was here that he died on 3rd October 1794. In his will, dated 31st August 1794, he left his silver and jewellery to the poor of the Temple district, but otherwise named Marie Grosholtz, "my pupil in my art", as his sole heir. The will and the inventory drawn up after his death are published as Appendices in Daninos's Une Révolution en cire. Despite the dislocation and financial exactions of the Revolutionary years, the inventory reveals that Curtius was still reasonably well off. Among his possessions were more than 60 paintings and 114 drawings and engravings, suggesting perhaps that he had a sideline in art dealing. The Salon de cire itself contained various mirrors and paintings, plus the Egyptian mummy "in its painted wooden box". There were twenty-eight standing figures in wax, ten further busts and 68 other models, representing various persons and animals, in cages and glass cases. Figures mentioned are Marat, Le Peletier, Franklin, Voltaire, Rousseau and Joseph Barat. Andrea Daninos, Une Révolution en cire: Francesco Orso et les cabinets de figures en France (Milan, 2016), chapter 2: "Philippe Curtius"
Salon of Sieur Curtius, boulevard du Temple entre Nicolet and Les Associés. Admission prices: In front of the partitioning balcony, 2s. Beyond the balcony, to go everywhere, 12s. Sieur Curtius, is a German artist, naturalised a Frenchman through many years’ domicile in France, and even more so by the patriotism he has shown during the Revolution, when he distinguished himself most honorably on several different occasions and in different manners. He has kept for many years on the boulevard du Temple and under the galleries of the Palais-Royal, cabinets of wax figures, which perfectly imitate nature; in both venues are also rare and curious objects, paintings, sculptures, and precious relics. Every year Curtius renews the two salons entirely and every month he changes something. There are fantasy figures, which are made for him in town; he keeps a copy when the heads have character or beauty. Besides these are modern Heroes who can be instantly recognised, and who are dressed from head to foot in costumes of the greatest veracity. The figures most in vogue this year (1790) in Curtius’s Salon are: the King, MM. Bailly, Lafayette, and several illustrious deputies of the National Assembly; the famous sieur Hulin, sieur Elie and the others principal victors of the Bastille, with celebrated prisoners of the fortress. There is a plan of the prison engraved on a stone by a prisoner; also cardboard models of the Bastille, both intact and half-demolished, which are very fine pieces. But still more impressive is the shirt which Henri IV, that model of Kings, wore when he received the fatal blow which plunged France into universal mourning. This shirt, with the bloody hole left by the assassin's knife, is accompanied by authentic historical certificates which leave no doubt as to the genuineness of the piece. Sieur Curtius conserves, among other things, an Egyptian mummy, the body of a princess of Memphis dead more than 3000 years ago. He takes trouble to offer to an avid public curiosity all sorts of new objects that excite interest in France. Almanach général de tous les Spectacles de Paris et des provinces for 1791. Another crier drew us to the Salon of lifesized wax figures, which is truly worth seeing. The King, the Queen, the Dauphin and his sister, Lafayette, Bailly, Voltaire, Rousseau, Franklin, the two famous prisoners (of the Bastille) Trent and Latude, the Indian ambassadors who were once here, Madame du Barry, sleeping and half naked, Maria Theresa, Clermont Tonnerre, and God knows who else, stand here in an extraordinary way, in their normal attire. ...... the Sieur Curtius filled his saloon next year with thieves of another sort. He exhibited a collection of ministers, farmers-general, lieutenants of the police, and princes of the blood. M. Necker, it may be supposed, was not forgotten; and the artist, as an encouragement for his talents, had a secret pension bestowed upon him in the Red Book. 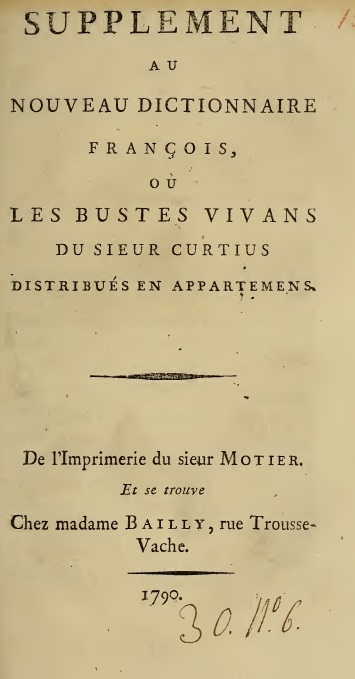 In the mean time, he continues to shew at two-pence a piece, the king, the queen, the little children, the marquis de la Fayette, M. de Clermont-Tonnere, &c. But, whether from laziness or economy, M. Curtius has furbished up some of his old busts for our modern heroes; converting Mandrin into the Count Mirabeau, Nivet into the Sieur Thouret, Cartouche into the famous Chapellier, &c. This circumstance was announced at the corners of the streets, in some pompous verses to the praise of the hero of America, and M. Bailly. M. Curtius has dishonoured himself by the publicly insulting esteemed men whilst awarding honours to individuals whose names posterity will utter with scorn. We will say nothing about his cabinet; it is no longer of interest to anyone since a false and dangerous patriotism has taken hold of sieur Curtius. 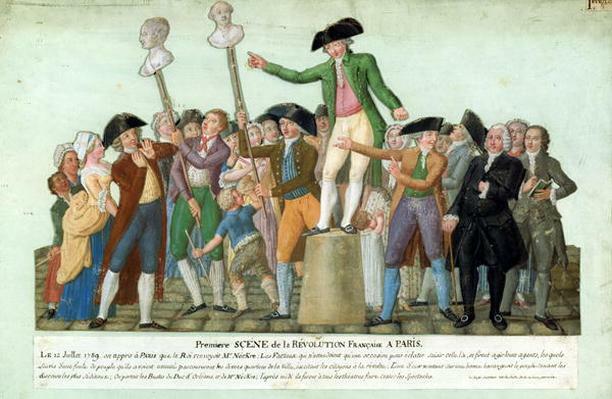 Prudhomme criticises Curtius for not displaying a model of Louis XVI on the guillotine. At present in the Cabinet of Curtius the figure of Lepeletier can be seen laid out on his deathbed, as he was displayed in the place des Piques and taken to the Pantheon. We should be grateful to an artist who exercises his talents on such subjects, suitable to sustain the public spirit. No doubt he will soon join with it the bust of the infamous Pâris, his assassin. But what prevents Curtius, who we know is a good patriot, from representing the death of Louis XVI? The sight of the tyrant on the scaffold would attract a large number of viewers. Such a subject is suitable for a republican people. Curtius for a long time showed Louis XVI at the dinner table with his family. That royal banquet amazed provincials, who returned home proud of having seen the royal family eat and drink. Louis XVI on the guillotine would be worth a full treatment. Hasn't Curtius made many lots of 2 sous showing Desrues and his wife? Hasn't he hurried to adorn his collection with the the busts of Lafayette, Favras, Barnave and Mirabeau, of his Holiness the Pope and the Great Turk?......If Curtius was really a patriot he would hurry to model Louis Capet guillotined; it is the way to attract people to his cabinet, which patriots will soon desert if the artist delays in offering this spectacle to fellow-citizens who could not be present themselves at the execution of the last of our tyrants. The Republic gives refuges to the arts only on condition that they serve to consacrate fortunate events and good principles. If they had done this before, J.J. Rousseau would never have banished them without pity from every free and well-ordered state. Athanase Détournelle, Journal de la Société républicaine des arts (1794) p.18-20. A later verdict: Curtius showed himself to be a patriot from the very beginning of the Revolution; he showed figures of Lafayette, Bailly, Mirabeau and other deputies of the Constituent Assembly, those of the principal prisoners and conquerors of the Bastille, and two models of this fortress prison, one in its original state and the other in ruins. But Curtius was a weathercock, like many men who don't boast about it, and have made a lucrative living out of it. He offered to the homage or horror of the public, the great men of the day, great men who were fashionable, triumphant or victims, showing their apotheosis or their punishment according to the circumstances. Thus were seen, turn by turn, in his salons, Girondins and Montagnards, Vergniaux and Danton, the duc d'Orleans and Philippe-Egalite, Marat and Charlotte Corday, the pere Duchesne and Robespierre, madame Roland and the capuchin Chabot, madame Tallien and Barras, Dumouriez and Talleyrand, Bonaparte, his familly, his marshalls, his favourites and some of his chamberlains and senators. His death or that of his inheritor, twenty years ago, may have stopped them showing effigies of kings, heroes of the Restoration, princes of the Holy Alliance etc. But they have been supplanted in that noble task by their successors and imitators in the boulevards St Martin and du Temple, who, lacking anyone better, have to show "great men" who are of very little consequence. I'm intrigued by the notion that older models were re-dressed as new characters.